The new Snakky Max is a taller version of the Snakky. Snakky Max is 1830 mm in height and designed to be banked next to Kiko Max range. Besides adaptation of the height, the selection and payment area has also been updated, whilst the delivery bin remains the same as the Snakky. The cell in Snakky Max is 120 mm higher than that of the standard Snakky, giving the possibility to have up to 7 trays with a maximum of 42 different selections. All this within a narrow cabinet, 735 mm, which goes smoothly through the doors. The cooling unit is as powerful as in the larger Sfera snack machine, enabling low temperatures at 5 for cans and bottles. Also it allows for special food variants of the Snakky Max, with up to 4 trays of food products. The Snakky Max food version will have a specific window with better insulation, as well as temperature control in the product cell. The ventilation of the cooling unit is front to back, which requires a minimum of 8 cm on the back of the machine. The new Snakky Max is a taller version of the Snakky. Snakky Max is 1830 mm in height and designed to be banked next to Kiko Max range. Besides adaptation of the height, the selection and payment area has also been updated, whilst the delivery bin remains the same as the Snakky. The cell in Snakky Max is 120 mm higher than that of the standard Snakky, giving the possibility to have up to 7 trays with a maximum of 42 different selections. All this within a narrow cabinet, 735 mm, which goes smoothly through the doors. 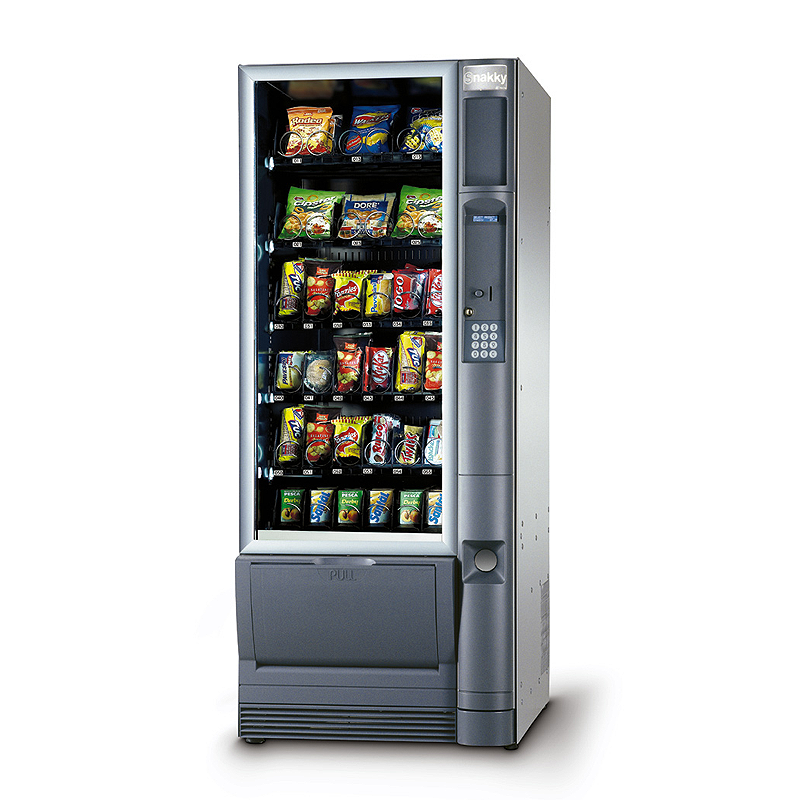 The cooling unit is as powerful as in the larger Sfera snack machine, enabling low temperatures at 5 for cans and bottles. Also it allows for special food variants of the Snakky Max, with up to 4 trays of food products. The Snakky Max food version will have a specific window with better insulation, as well as temperature control in the product cell. The ventilation of the cooling unit is front to back, which requires a minimum of 8 cm on the back of the machine.